The 12MP camera sensor in Moto G6 Plus is slightly better with an aperture of f/1.7. It is capable of capturing 4K (2160p) videos at 30fps. While the 12MP camera in Moto G6 has an aperture of f/1.8. It can only capture full HD (1080p) videos (partially due to the CPU). Moto G6 Play has a single rear camera. The 13MP f/2.0 rear camera can record videos in full HD at 30fps. All three Moto G6 devices have a similar 8MP f/2.2 camera sensor. Only the US version of Moto G6 Play is equipped with a 5MP front camera. None of these front cameras offers wide-angle selfie. But in the camera mode, you can choose group selfie mode to accommodate more people. LED flash for the front camera can be found in all three models: Moto G6 Play, Moto G6 and Moto G6 Plus. Moto G6 and G6 Plus share a similar design. The fingerprint sensor is located in the front of the phone below the screen. But Moto G6 Play got a new design for the fingerprint sensor, which is located in the Motorola (M) logo in the back of the phone. This actually is the best location for Moto phones. 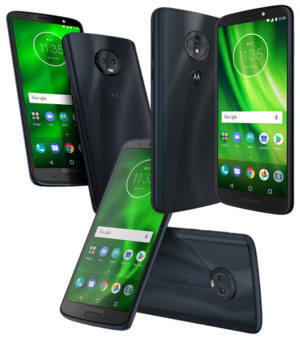 Moto G6, Moto G6 Play and Moto G6 Plus all have a non-removable battery. Both Moto G6 and G6 Plus use glass for the back cover. Moto G6 Play uses plastic. The battery capacity varies among these 3 phones. Moto G6 Play has the largest battery capacity os 4000mAh. Moto G6 has the smallest battery with a capacity of 3000mAh. Moto G6 Plus has a slightly larger (3200mAh) battery. Conclusion: which Moto G6 is for you? Some readers asked for the help to decide a Moto G6 model. Moto G6 Play is for users who need a basic phone with decent performance, great battery life, and a low price tag. Moto G6 is a mainstream middle-range Android phone with decent performance. Moto G6 Plus is for users who demand more from a mainstream middle-range smartphone. It actually fills the gap between Moto X series and G series. Of course, in some regions, only two models are available. Normally, in regions where Moto X4 was released, Moto G6 Plus will not be offered. Do you know the differences between Moto G6, Moto G6 Play and Moto G6 Plus? If you have questions on Moto G6, Moto G6 Play and Moto G6 Plus, please let us know them in the comment box below. You can also find and download Moto G6 user manual in your language in Official Moto G6 User Manual page. How do I move # data and # bal from home screen G6 Play? What exactly do you want to remove? For apps and widgets, you can tap and hold, then to remove.